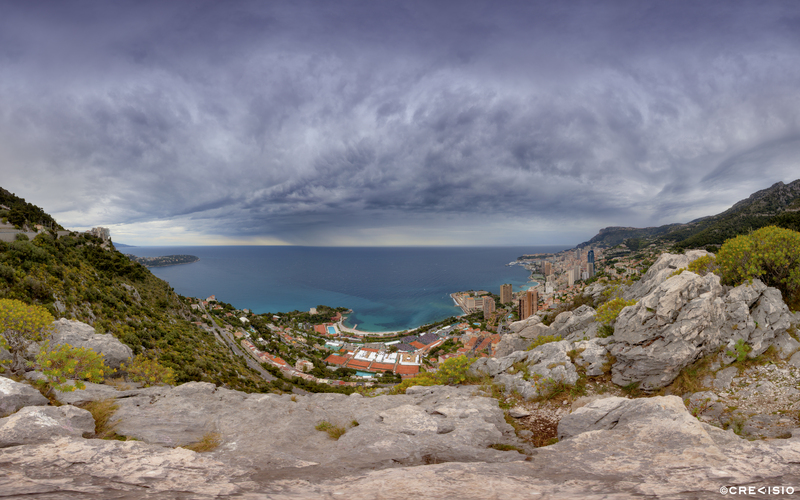 Panorama over the Principality of Monaco during the tennis ATP Monte-Carlo Rolex Masters 2015 final, Novak Djokovic vs. Tomas Berdych. This 110 megapixel photograph was shot during the start of the tennis match final from a cliff above Monaco. Unfortunately the match was interrupted due to the nearing rain showers that hit the Principality in the afternoon. Novak Djokovic beat Tomas Berdych 7-5, 4-6, 6-3. You may download a free wallpaper version for personal use by clicking the photo above or the link on the side. For commercial use, please contact Crevisio.